Natural Killer (NK) Cells in Antibacterial Innate Immunity: Angels or Devils? Natural killer (NK) cells were first described as immune leukocytes that could kill tumor cells and soon after were reported to kill virus-infected cells. In the mid-1980s, 10 years after their discovery, NK cells were also demonstrated to contribute to the fight against bacterial infection, particularly because of crosstalk with other leukocytes. A wide variety of immune cells are now recognized to interact with NK cells through the production of cytokines such as interleukin (IL)-2, IL-12, IL-15 and IL-18, which boost NK cell activities. The recent demonstration that NK cells express pattern recognition receptors, namely Toll-like and nucleotide oligomerization domain (NOD)-like receptors, led to the understanding that these cells are not only under the control of accessory cells, but can be directly involved in the antibacterial response thanks to their capacity to recognize pathogen-associated molecular patterns. Interferon (IFN)-γ is the predominant cytokine produced by activated NK cells. IFN-γ is a key contributor to antibacterial immune defense. However, in synergy with other inflammatory cytokines, IFN-γ can also lead to deleterious effects similar to those observed during sepsis. Accordingly, as the main source of IFN-γ in the early phase of infection, NK cells display both beneficial and deleterious effects, depending on the circumstances. Microbial invasion into sterile body compartments causes infectious diseases that are locally addressed by cells of the innate immune system (1). Although actors of humoral immunity such as natural antibodies, pentraxins and factors of the complement system contribute to fight microbes in the early steps of innate immune response, cellular immunity does play a key role (2). As sensors of pathogenic microbial agents, innate immune cells recognize microbial-associated or pathogen-associated molecular patterns (PAMPs) by intracellular or cell surface receptors. PAMPs are microbial molecules such as the endotoxin of gram-negative bacteria (lipopolysaccharide [LPS]), the lipoteichoic acid of grampositive bacteria and many other components (for example, lipoproteins, outermembrane proteins, flagellin, fimbriae and peptidoglycan). In addition, bacterial lysis results in the release of internal motifs (for example, heat-shock proteins, RNA, and DNA fragments), which are additional PAMPs recognized by immune cells. These cells express pattern recognition receptors (PRRs), specifically recognizing PAMPs. The activation of PRRs initiates the innate immune antiinfectious response and the early production of cytokines, which orchestrate this response (3). Among PRRs, the discovery of Toll-like receptors (TLRs) and nucleotide oligomerization domain (NOD)-like receptors (NLRs) has led to an understanding of the interaction between microorganisms and hosts, as well as the very early steps of the innate immune response. TLRs are expressed either on the cell surface (TLR1, -2, -4, -5 and -6) or within endosomes (TLR3, -7, -8 and -9). NLRs are cytoplasmic sensors. In addition to cytokine production, the interaction of different PAMPs with their respective TLRs or NLRs initiates numerous intracellular signaling pathways that result in the activation of immune and inflammatory genes, including costimulatory molecules, adhesion molecules and antimicrobial mediators (2,4,5). After infection, after PAMP recognition by immune cells, there are two well-characterized steps of the immune response illustrated by the production of pro- and antiinflammatory cytokines. In the most severe cases of infection (e.g., during sepsis), an overzealous release of proinflammatory cytokines and inflammatory mediators by activated leukocytes, epithelial cells and endothelial cells, known as a “cytokine storm,” leads to deleterious effects such as organ dysfunction and even death. Almost concomitantly, this proinflammatory response is accompanied by the release of antiinflammatory cytokines and neuromediators aimed to dampen the inflammatory process. The side effect of this antiinflammatory response is the alteration of immune status known as the “compensatory antiinflammatory response syndrome” (6), favoring the occurrence of nosocomial infections (7,8). The early cellular immune response involves the contribution of mast cells, mononuclear phagocytes and polymorphonuclear phagocytes (9). More recently, it became evident that natural killer (NK) cells were also key players in early immunity (10). The fact that TLRs were recently discovered to be expressed by NK cells has opened a new interest for their putative involvement in innate immune response to bacterial infections. It seems that in contrast to phagocytes, the activation of NK cells by PAMPs can only occur within a complex crosstalk with other immune cells that offer the cytokine microenvironment required for NK cell responsiveness (11). Accordingly, similar to any other cellular or molecular participant in infectious diseases, NK cells can play an “angel” or “devil” role, depending on the circumstances. The same actors, which contribute to fight infection, can act in synergy, leading to acute deleterious inflammation. This is particularly the case of γ-interferon (IFN-γ), which is one of the main cytokines produced by NK cells (12). The concept of NK cells was first reported in 1975 by Hans Wigzell’s group, which established that leukemia cell lines could be lysed by cells with the morphology of small lymphocytes and devoid of T- and B-cell characteristics (13). Their expression of Fcγ receptors (14), and their capacity to kill target cells through antibody-dependent cell cytotoxicity, was demonstrated thereafter (15). Soon after, it was reported that NK cells were also active against virus-infected cells (16), opening a new field of investigation to be explored. In contrast, it took more time to accept the role of NK cells in bacterial infection. The lack of natural antibacterial activity against Salmonella typhimurium of beige mice, known to be deficient in NK activity, was not recognized as evidence supporting the role of NK effector cells in natural antibacterial activity (17). The first report on the role of NK cells during bacterial infection was related to their capacity to lyse either Shigella flexneri-infected HeLa cells (18), Legionella pneumophila-infected monocytes (19) or Mycobacterium avium-infected monocytes (20). The latter study also reported that NK cells could help macrophages to inhibit growth or kill intracellular bacilli (21). Similar findings were reported for Mycobacterium lepraemurium (22). The key in vivo role of NK cells during a bacterial infection was initially established in M. avium infection: an in vivo depletion of NK activity using antibodies provided direct evidence on their role in the control of intracellular mycobacterial pathogens (23). Since then, the role of NK cells in bacterial infection has been clearly established, including the cytokine microenvironment and the cellular crosstalks required for an active contribution of these cells in innate antibacterial immunity (Figure 1). Activation of NK cells by bacterial PAMPs. NK cells are activated within a network of accessory cells that sense bacterial PAMPs. Activation of accessory cells leads to the production of cytokines that contribute to the functional activation of NK cells, while sensing of PAMPs by NK cells themselves further enhances NK cell reactivity. All listed cytokines have been shown to amplify NK cell activity, either alone or in synergy. Negative signals can be directly delivered to NK cells (for example, IL-10 and TGF-β produced by Tregs, prostaglandins or glucocorticoids) or indirectly by downregulating the function of accessory cells. PGN, peptidoglycan; OmpA, outer-membrane protein A, MØ, macrophages; PMN, polymorphonuclear leukocytes (neutrophils); B, B lympocytes; MAST, mast cell; EPITH., epithelial cell; PGE2, prostaglandin E2; PGD2, prostaglandin D2. It is possible that all NK cell subsets are not equivalent in their antibacterial activity. However, human and mouse NK cell subsets will not be detailed in this review (for detailed reviews about NK cell subsets, see Huntington et al. and Wilk et al. ). For example, it has been shown that in response to BCG (bacillus Calmette-Guérin), human CD56BRIGHT NK cells were cells mainly involved in IFN-γ production, whereas the CD56DIM subset contained higher levels of perforin and granzyme A (26). In addition, NK cell differentiation and function are influenced by tissue environment. Specific cellular and molecular environments in the uterus, liver, spleen, lungs or blood influence the precise nature of NK cells. Furthermore, differences have been noticed between species. However, it should be mentioned that most studied human and murine NK cells are generally derived from different compartments. Most parameters of human NK cells have been acquired from cells derived from the blood compartment, whereas murine NK cells are mostly derived from spleen. It is interesting to note that the blood environment in mice and humans are greatly different, with murine plasma favoring the resilience of mice to bacterial infection (27). A large part of the knowledge on TLR expression in human NK cells was initially acquired in studies on the basis of mRNA detection. In human NK cells, divergent observations were reported. In pooled purified NK T cell-like (NKT cell-like) and NK cells (CD3+CD56+ and NK CD3−CD56+, respectively), the expression of all TLR mRNA (TLR1-9) was found (28), but in isolated NK cells, mRNA expression levels of TLR1 were highest, followed by moderate levels of TLR2, TLR3, TLR5 and TLR6 (29). One group demonstrated a lack of TLR9 mRNA expression in two different sorted populations (NKT cell-like CD3+CD56+, NK CD3−CD56dim and NK CD3−CD56bright) (10). Regarding murine NK cells, divergences in mRNA expression were also reported. One study reported that all TLR mRNAs were expressed in splenic murine NK cells (30), whereas in the other, only TLR2, TLR4, TLR8 and TLR9 were found, but not TLR3 and TLR7 (31). Of course mRNA expression is not always a reflection of the protein expression, because of posttranscriptional, translational and posttranslational events. Furthermore, cellular localization may also influence the cell surface expression. Studying human uterine NK cells, Eriksson et al. (32) showed that TLR2 was not localized on the cell surface but was expressed intracellularly. For circulating human NK cells, the surface expression of this receptor remains controversial. Flo et al. (33) failed to detect TLR2 expression by flow cytometry on a freshly isolated human NK cell surface using two different monoclonal antibodies. In contrast, Becker et al. (34) showed that after 24 h of culture, purified NK cells displayed TLR2 surface expression, as revealed by staining with a polyclonal antibody. Interestingly, TLR3 expression by human NK cells was shown to be expressed both on the cell surface (35) and intracellularly (36). TLR9 was found either in all human blood NK cells (36) or only in a small subpopulation, of which the percent could be increased after yellow fever vaccination (37). 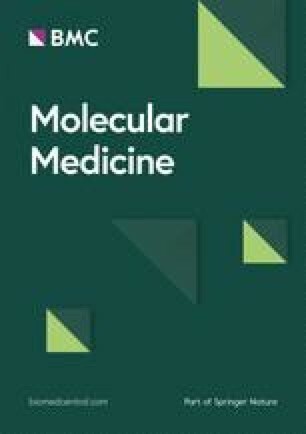 Concerning mouse spleen NK, a recent study showed that cell surface expression of TLR2 was present on ∼65% of negatively selected freshly isolated NK cells and was not significantly modified after 48 h of culture in the presence of IL-2 and IFN-α with or without the Vaccinia virus (31). The presence of any TLRs can be demonstrated indirectly by the activation of NK cells by TLR agonists (Table 1). For example, flagellin, the ligand of TLR5, favors NK cell recruitment in lymph nodes, upregulates CD69 expression on NK cells and induces NK-cell proliferation and IFN-γ production (38). In contrast, flagellin abrogates cytosine-phosphate-guanine (CpG) oligonucleotide-induced cytolytic activity of NK cells (39). However, CpG oligonucleotide, a TLR9 ligand, failed to directly activate isolated NK cells (28,29) because most of these activations are accessory cells and/or accessory cytokine-dependent (see below). Response of NK cells to TLR agonists and other RAMPs. ND, not determined; PBMC, human peripheral blood mononuclear cells; MØ, monocytes or macrophages; pDC, plasmacytoid dendritic cells; APC, antigen presenting cells; BMDC, bone marrow derived dendritic cells; b, bovine; h, human; m, murine. aThe second number in each reference citation indicates the volume; the last number indicates the beginning page number. The method for NK cell purification is a technical limitation that can explain some of the controversial observations. Often used, the positive selection with magnetic microbeads may either induce cellular activation and modification of cell surface marker expression (40) or be associated with the presence of contaminating dendritic cells (41). Divergent results are similarly obtained in vivo depending on the antibody used for NK cell depletion (42). For example, in vivo cell depletion with anti-NK1.1 antibodies leads to the elimination of both NK and NKT cells, whereas the use of the anti-asialo monosialotetrahexosylganglioside (GM1) antibody depletes NK cells and basophils (43). Thus, the purification method (and possible cellular activation) may indeed contribute to the controversial reports published when studying the expression of TLRs in NK cells. Furthermore, analysis performed either extemporaneously or after cell culture can also lead to divergent results. Others PRRs have been expressed by NK cells, including the families of cytoplasmic sensors, the NOD-like receptors (NLRs) and the retinoic acid inducible gene I (RIG-I)-like receptors. NLRs include NOD1, NOD2 and NOD-like receptor family, pyrin domain containing 3 (NLRP3). NOD1 is a receptor for small motifs derived from peptidoglycan, such as diaminopimelic acid-containing muramyl tripeptide (mur-tri-DAP), more frequently found among gram-negative bacteria. NOD2 is a receptor for muramyl dipeptide (MDP), the smallest active part of peptidoglycans from both gram-negative and gram-positive bacteria. NLRP3 is a key member of the inflammasome and a sensor for many toxic agents. Human NK cells express high levels of intracellular NOD2, and NLRP3, whereas NOD1 is expressed at very low levels (36). Human NK cells naturally internalize MDP, which together with IFN-α and IL-12 stimulate the secretion of IFN-γ (44). Studies on the activation of NK cells by synthetic double-strand RNA (poly I:C) led to the conclusion that RIG-I-like receptor expression but not TLR3 was involved in NK cell activation (45). The use of mice deficient for MDA5 (another member of the RIG-I-like receptor family, a key intracellular sensor of double-stranded RNA), and that of mice deficient for interferonpromoter stimulator-1 (an adaptor molecule of the MDA5 pathway), led to the conclusion that this pathway was mainly involved in accessory cells (46,47). In addition, toxins released by bacteria can directly activate NK cells. Some of them are known as superantigens. In 1982, we showed for the first time that the streptococcal erythrogenic toxin, renamed streptococcal pyrogenic exotoxin A (SPEA) later, was able to induce in vivo circulating IFN-γ (48). The first link of this toxin with NK cells was probably reported in 1991 by Sacks et al. (49), who showed that SPEA increased NK cell cytotoxic activity. The capacity of SPEA to activate NK cells and induce IFN-γ was further confirmed (50). Staphylococcal enterotoxin B is another superantigen able to induce the release of IFN-γ by purified NK cells (51). In contrast to staphylococcal enterotoxin B, studies suggest that NK cells were not directly activated by staphylococcal enterotoxin A. Staphylococcal enterotoxin A-activated T cells and monocytes contribute to the cytokine environment required for the activation of NK cells (52,53). A similar observation was reported for listeriolysin O, a cytolytic virulence factor of Listeria monocytogenes that induced IFN-γ production by NK cells through the stimulation by IL-12 and IL-18 produced by macrophages (54). The exotoxin A produced by Pseudomonas aeruginosa was shown to activate in vivo NK cell cytotoxicity (55). In contrast, in vitro studies on peripheral blood mononuclear cells revealed that P. aeruginosa exerts an inhibitory action on NK cells, preventing IFN-γ production and cytotoxicity (56). If NK cells are key actors of the innate immune defense, it makes sense that some pathogens have developed strategies to limit the action and activation of these cells. This is the case of the leukotoxin produced by Actinobacillus actinomycetemcomitans, which inhibits the upregulation of cell surface markers associated with NK cell activation (57). More drastically was the case of Yersinia pestis, in which the yersinial outer membrane protein-11 (YopM) molecule, a 41.5-kDa virulence protein, interferes with innate immunity by causing a global depletion of NK cells, possibly by affecting the expression of IL-15 receptor a and IL-15 (58). NK cells produce cytokines that contribute to the inflammatory environment during an infection. IFN-γ, granulocytemacrophage colony-stimulating factor (GM-CSF), and tumor necrosis factor (TNF)-α are the main cytokines generated by activated NK cells (24,59). For example, in the cecal ligation and puncture (CLP) model of polymicrobial peritonitis, it was established that liver NK cells were the main source of IFN-γ (60). Whether these cytokine productions are accessory cell-dependent remains a controversial issue. Nonetheless, there are numerous reports showing that purified NK cells can directly respond to PAMPs in the absence of accessory cells, but in the presence of cytokines such as IL-2, IL-12, IL-15 or IL-18 (see Table 1). Whereas most cytokines are undetectable in the bloodstream of healthy subjects during homeostasis, there is a low and different expression in various tissues. This expression creates a microenvironment that modulates the precise nature of different NK cells. During infection and sepsis, a large panel of cytokines is generated, offering NK cells the appropriate environment to respond to PAMPs, allowing contribution to the cytokine cascade and eventually to the cytokine storm (1,61). Activation of NK cells can lead to different changes including cytotoxity associated with the release of perforin and granzyme and the production of cytokines. The secretion of cellular granules containing cytotoxic mediators (for example, perforin and granzyme) and cytokines (for example, IFN-γ) are not achieved similarly. The release of cytotoxic molecules is polarized toward a target cell, whereas that of cytokines is not (62). NK cells can be rapidly activated by some of the cytokines present in the early stages of infection, such as IL-12, IL-15 or IL-18, allowing the secretion of large amounts of IFN-γ and GM-CSF. NK cells also generate other cytokines such as IL-5 (63), IL-6 (64), IL-10 (65,66), transforming growth factor (TGF)-β (67), IL-12 (68), IL-13 (69), IL-16 (25), IL-17 (70) and IL-22 (71). Similarly, NK cells are source of various chemokines such as XCL1, CCL1, CCL2 and CXCL16 (72); CXCL8, CCL8, CCL26 and CCL17 (25); CXCL10 (73); CCL3 and CCL4 (74); and CCL5 (75). NK cells also release soluble TNF-α (76) and express its membrane form (77), as well as other members of the TNF family (that is, lymphotoxin [LT]-α, LT-β, Fas ligand, CD27L, CD30L, OX40L, 4-1BB ligand (4-1BBL), TNF-related apoptosis-inducing ligand (TRAIL) and LIGHT (homologous to lymphotoxins, exhibits inducible expression, competes with HSV glycoprotein D for HVEM, a receptor expressed on T-lymphocytes) (72,78). The fact that NK cells are an important source of proinflammatory cytokines, particularly IFN-γ, illustrates how these cells are both contributing to the antiinfectious process and amplifying the inflammatory response that can lead to organ failure and death, as seen in polymicrobial sepsis. NK cells have been identified in numerous studies as the main source of IFN-γ during infection by different bacterial pathogens such as Francisella tularensis (79), L. monocytogenes (80, 81, 82), Chlamydia pneumoniae (83), and Yersinia enterocolitica (84) and in experimental endotoxin-induced lethal shock (85) and polymicrobial sepsis (86) (Tables 1 and 2). The protective role of IFN-γ was shown in murine salmonellosis, particularly in synergy with TNF-α when injected 6 h before S. typhimurium (87). This beneficial role was also demonstrated in IFN-γ receptor-deficient mice, which were more sensitive to group B Streptococcus (88) or to ascendens stent peritonitis (89) than wild-type mice. In contrast, neutralization of IFN-γ prevented lethality in primate gram-negative bacteriemic shock (90) and protected mice infected intravenously with Staphylococcus aureus (91). The deleterious role of IFN-γ was demonstrated by its capacity to increase death when injected in mice, particularly when acting in synergy with TNF-α (12). This deleterious effect was also shown in the CLP model of polymicrobial peritonitis (92) and in a CLP model followed by a P. aeruginosa infection (93). Polymicrobial peritonitis performed in IFN-γ receptor-deficient mice (94) or in rats given anti-IFN-γ antibodies (95) led to the similar demonstration of this negative role. In mice injected with LPS, the ambiguous role of IFN-γ was demonstrated: IFN-γ protected against LPS-induced lung edema but acted in synergy with LPS to enhance the occurrence of death (96). Some examples of cellular crosstalk allowing NK cell response during bacterial infections or PAMP challenge. NK cells were also recognized as a source of α-defensins and cathelicidin (LL37), well-known antibacterial peptides (97). NK cells can also generate indoleamine 2,3-dioxygenase (IDO) and nitric oxide (NO), two other mediators known to limit the infectious process (98,99). So far, the generation of IDO by NK cells has not been demonstrated in the context of bacterial infection, but has been in a transplantation model after IL-4 treatment (100). Similarly, the production of NO has not been demonstrated in infectious models, but rather in response to IL-2 (101), IL-12 and TNF-α (102). In both cases, the authors showed activation of inducible NO synthase. In addition, NK cells express endothelial NO synthase and thus can constitutively produce NO (103). Most interestingly, it was recently shown that NK cells can also be a source of resolvin E1, suggesting that they can also contribute to the resolution phase of inflammation (104). Despite the fact that NK cells are equipped to recognize bacterial patterns, it is well established that accessory cells contribute both indirectly (through soluble factors) and directly (through cell-to-cell contact) to trigger the cellular response. Several studies have demonstrated the NK cell activation by TLR agonists can occur in the absence of accessory cells but in the presence of their soluble cytokines. IL-2, IFN-α/β, IL-12, IL-15, IL-18 and IL-21 are the main cytokines that trigger NK cells, either alone or in a synergistic combination (105,106). Other cytokines have also been reported to amplify the survival, the proliferation, the IFN-γ production or the cytotoxicity of NK cells. This is the case for TNF-α (107), IL-4 (100,108), IL-1β (109), IL-7 (71), IL-23 (110) and IL-33 (111). NK cells respond to chemoattractant signals delivered by numerous chemokines, particularly CCL2 (macrophage-chemoattractant protein [MCP]-1), CCL3 (macrophage inflammatory protein [MIP]-1α), CCL4 (MIP-1β), CCL5 (regulated upon activation, normal T-cell expressed and [presumably] secreted [RANTES]), CCL7 (MCP-3), CCL8 (MCP-2) and CXCL10 (interferon γ-induced protein [IP]-10) (112). In the case of CCL6 (C10), transgenic mice overexpressing this chemokine were shown to be protected against an otherwise lethal CLP, associated with an enhanced recruitment of NK cells in the peritoneal cavity (113). Furthermore, these chemokines enhance the cytolytic response of NK cells. Whereas IL-15 is the prerequisite cytokine for NK cell maturation and differentiation from bone marrow cells (114), it is also required for an optimal IFN-γ production (115). Interestingly, IL-15 can be delivered to NK cells in a trans-presentation manner (116,117). IL-15 and IL-2 share a common receptor chain (IL-2Rβ) (118), and NK cells are also responsive to IL-2 (119). Such a responsiveness is not only an illustration of the crosstalk between NK cells and T lymphocytes, the main source of IL-2, but also with dendritic cells (DCs), which have been shown to contribute to NK cell activation through the release of IL-2 (120). IL-12 was recognized as an important cytokine to fight infectious diseases (121,122), particularly through its capacity to induce IFN-γ production, as shown in mice infected with Y. enterocolitica (84) or S. typhimurium (123). Salmonella was also shown to induce the production of IL-1β and IL-23 by macrophages favoring the production of IFN-γ by NK cells (124). A similar synergy between IL-1β and IL-12 leading to an enhanced production of IFN-γ was also reported in response to LPS and L. monocytogenes (109). It is interesting to note that in return, IFN-γ can favor the production of IL-12, as shown during the activation of macrophages by Mycobacterium bovis (125). Similarly, IL-18, known to contribute to the antiinfectious response and neutralization during an infection with Y. enterocolitica or S. typhimurium, was shown to be deleterious (126). This study suggested that the role of IL-18 depends on its capacity to induce the production of IFN-γ. In IL-18-deficient mice injected with Propionibacterium acnes, IFN-γ production in response to LPS was markedly reduced and NK cell activity was significantly impaired (127). Interestingly, during infection, MyD88-deficient NK cells fail to produce IFN-γ (128). Because MyD88 is a signaling molecule shared by most TLR and also by IL-18 receptor, it is conceivable that its absence could affect both pathways during an immune response to infection. The use of IL-12/IL-18 double KO mice and combined experiments with anti-IL-12 and anti-IL-18 antibodies demonstrated that both IL-12 and IL-18 cooperate to activate NK cells (127,129). A recent report showed that IL-18 primes NK cells to become responsive to IL-12 and to release IFN-γ (130). A coordinated action with other cytokines such as IFN-α/β has been demonstrated during viral infection. TLR4 agonists can also generate the release of IFN-α/β; it is most probable that IFN-α/β also contributes to the activation of NK cells during bacterial infection (131). Of course, NK cells are also responsive to antiinflammatory mediators such as IL-4 (106), IL-10 (132), TGF-β (133), prostaglandin E2 (134,135), prostaglandin D2 (136) and glucocorticoids (137,138). In mice, in vivo blocking of IL-10 reverted the hyporesponsive status of NK cells in the lungs or the liver (139,140). In patients with chronic hepatitis B virus infection, in ex vivo experiments, blockade of IL-10 or TGF-β restored the altered capacity of NK to produce IFN-γ (141). However, IL-10 may not always be a direct inhibitor for NK cells. Particularly, IL-10 was shown to enhance IL-18-induced IFN-γ production and IL-18- and IL-12-induced NK cell cytotoxicity and proliferation (142,143). Such a paradoxical effect of IL-10 was confirmed when regulatory DCs were added to NK cells (144). These cocultures led to enhanced NK cell-dependent cytotoxicity and IFN-γ production. When regulatory DCs were derived from IL-10 KO mice, their amplificatory role was significantly lower. The activation of NK cells in bacterial infection has often been linked to a cellular crosstalk with accessory cells that allows NK cell activation after direct interaction or accessory and NK cells with PAMPs (145). Several accessory cells have been described as a source of activating signals for NK cells, such as DCs, polymorphonuclear neutrophils, macrophages, mast cells, epithelial cells and B and T lymphocytes, including regulatory T-cells (Tregs) (see Table 2). In vitro production of IFN-γ by spleen cells stimulated with S. typhimurium requires the help of adherent cells or adherent cell-derived factors (146). In this early study, NK cells were not identified as a source of IFN-γ, and adherent cells could have been either DCs or macrophages, making this report among the first to demonstrate that a cellular crosstalk was required for IFN-γ production. Since then, the requirement of accessory cells for NK cell activation was well documented (see Newman and Riley  for a review). DCs were identified as a key partner for NK cells, particularly because they are a major source of IL-12 and can also produce IL-15, IL-18 and IFN-α (11,147). For example, proliferation, cytotoxic activity and IFN-γ production by LPS-stimulated NK cells depended on major histocompatibility complex (MHC) class II+ B7+ CD14− accessory cells, most probably DCs (148). Studying the response of NK cells to L. monocytogenes, it was demonstrated that both cytokines and cell contact with infected DCs were required for optimal IFN-γ production by NK cells (149). CX3CL1 (fractalkine) expressed on mature DCs is another player in the synapses formed between DCs and NK cells (150). Such contact was visualized by clustering of DCs, not only with NK cells, but also with granulocytes and monocytes/macrophages (151) and involved the priming of NK cells by IFN-α/β and a trans-presentation of IL-15 (147). Although the contribution of monocytes was shown to counteract the effects of DCs (148), other reports demonstrated a positive effect of monocytes/macrophages. For example, in Legionella pneumophila or L. monocytogenes infection, macrophages favored the production of IFN-γ by NK cells (152,153). In vitro, the presence of macrophages was fundamental for the expression of CD69 by NK cells in the presence of LPS (154). Crosstalk between human NK cells and macrophages infected with intracellular Salmonella was also demonstrated. These macrophage-activated NK cells caused the secretion of IFN-γ and degranulation. The NK cell activation required the release of IL-2, IL-12, IL-15 and IL-18 and contact between NK cells and infected macrophages (155). Liver macrophages (Kupffer cells) were also shown to crosstalk with NK cells during activation in the presence of TLR2, TLR3 or TLR4 agonists, either in vitro or in vivo (156,157). The activation was shown to depend on IL-18 and cell-to-cell contact. Similar to the reciprocal activation identified between DCs and NK cells (158), the crosstalk between macrophages and NK cells is bidirectional. For example, NK cells promote phagocytosis of Escherichia coli by the macrophages through a CD40/CD154 interaction (154). NK cell activation leads to a dramatic reduction in the number of intramacrophagic live Salmonella (155). In a CLP model of peritonitis, macrophage phagocytosis, NO production and IL-6 levels were decreased in NK cell-depleted mice compared with controls (159). Indeed, coculture of NK cells and macrophages significantly increased activation levels of both cell types, an activation determined to be cell-to-cell contact-dependent (154). Of note is that the activation of monocyte and macrophages by TLR agonists leads to the expression of MHC class I-related chain A (MICA), a ligand for NK group 2 (NKG2) of receptors, member D (NKG2D) and the ligand for the NKG2D receptor, constitutively expressed on all NK cells (160,161). The NKG2D receptor is expressed predominantly on NK cells, NK T cells and T cells. This receptor recognizes infected cells through surface ligand expression on stressed cells. The proposed role of the NKG2D receptor in innate immune responses to cellular and tissue stress is based on the ability of the receptor to stimulate cytotoxic effects of NK and T cells and the production of IFN-γ and TNF-α. In P. aeruginosa lung infection, NKG2D is also involved in epithelial cell sloughing (162), whereas on the other hand, IFN-γ production by NK cells and bacterial clearance depends on the NKG2D ligand (163). Neutrophils are central players during innate immunity against infection. Their interaction with NK cells is not surprising. During L. monocytogenes infection, granulocytes produce IL-12 and favor IFN-γ production by NK cells (164). During L. pneumophila infection, neutrophils immediately produce IL-18, which is indispensable for NK cell activation (165). As mentioned above for macrophages, NK cells can also activate neutrophils and promote their survival; upregulate cell surface expression of CD64, CD11b and CD69; and enhance the production of superoxide anions and heparin-binding epidermal growth factor (166). This property observed when NK cells were exposed to IL-15 and IL-18 partially depended on their production of GM-CSF. The detailed nature of the bidirectional crosstalk between neutrophils and NK cells is now provided in an extensive review (167). Similarly, mast cells are key actors of innate immunity, thanks to their capacity to release preformed cytokines, particularly TNF-α (168). It was reported that, in the presence of agonists for TLR3, TLR4 and TLR9, mast cells in coculture experiments stimulated NK cells to produce IFN-γ in a contact-dependent and TNF-α-independent manner (169). Lymphocytes also interact with NK cells. B-lymphocytes were recognized long ago as accessory cells for the production of IFN-γ by NK cells (170). In return, IFN-γ inhibits polyclonal B-cell proliferation but favors the IgG2a response (171). Recently, it was reported during a L. monocytogenes infection that a subpopulation of B-lymphocytes (PDCA-1+ Siglec-H− CD19+) activated NK cells via secretion of IFN-α (172). T lymphocytes also dialogue with NK cells in a reciprocal fashion. For example, NK cells derived from pleural fluids of patients with tuberculosis pleurisy induce T-lymphocyte activation through ICAM-1 engagement (173). After lethal injection of LPS, IL-18 was shown as fundamental to trigger γδT cells to produce IL-17A, which together with IL-18, contribute to the IFN-γ production by NK cells (174). Tregs constitute another T-cell subtype characterized as CD4+CD25+Foxp3+ and able to secrete antiinflammatory cytokines (for example, IL-10 and TGF-β1) and thus behaving as suppressor cells. Alteration of the immune system after sepsis is in part consecutive to the action of Tregs (175). Tregs and their cytokines behave as inhibitors of NK cell function (cytotoxicity and IFN-γ production) (176,177). Of course, cells other than Tregs can downregulate NK cell function through the production of IL-10, despite its contradictory properties on NK cells (see above); this is particularly the case of macrophages (148) and B-lymphocytes (178). Myeloid-derived suppressor cells can impair NK cell development and function (179) as well as Kupffer cells (156) and alveolar macrophages (135) via the release of IL-10, TGF-β or prostaglandin E2. Most interestingly, nonimmune cells can release NK-activating cytokines. This is the case of epithelial cells, which on infection with Chlamydia trachomatis can release IL-18, thus favoring the production of IFN-γ by NK cells (180). In addition, epithelial cells upon infection can increase their expression of NKG2D ligand, thus favoring a crosstalk with NK cells (162). As previously mentioned, NK cells are closely associated with both the fight against bacterial infection and the damages associated with an overzealous inflammatory response. According to experimental models, a beneficial or a deleterious contribution has been attributed to NK cells (Table 3). For example, when L. monocytogenes infection was investigated, Dunn and North (181) showed that the early production of IFN-γ by NK cells was essential for resistance to listeriosis. In contrast, Teixeira and Kaufmann (80) reported that NK cell depletion led to an enhanced listerial clearing. The fact that the route of infection (subcutaneous and intravenous, respectively) and the mouse strains were different may explain such a discrepancy. Indeed, it was proposed that CD8+ T lymphocytes may play a more important role than NK cells after intravenous L. monocytogenes infection (81). In addition, phenotypic differences in NK cells were illustrated in C3H/HeN and BALB/c mice with P. aeruginosa chronic lung infection (182). Examples of the half-angel half-devil role of NK cells during bacterial infections. 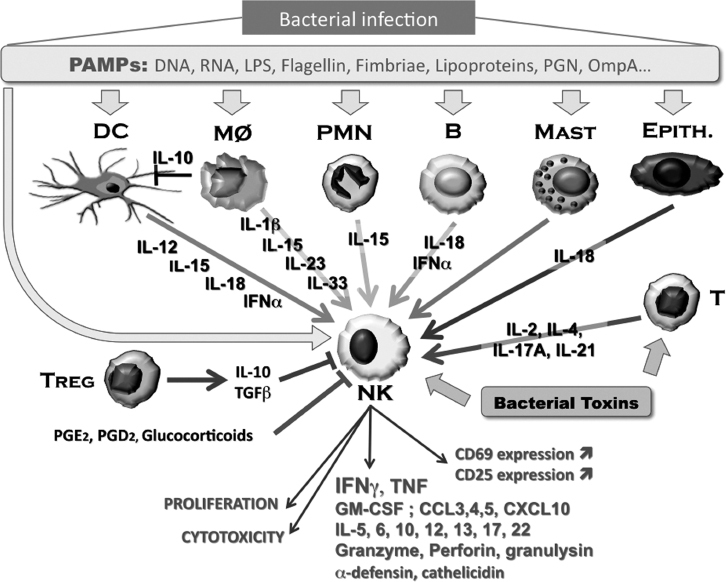 In the CLP model of peritonitis, NK cells were shown to contribute to the early local and systemic control of the bacterial burden (183). In this study, however, depletion of NK cells by anti-asialo GM1 antibodies did not significantly modify the survival curves. In contrast, NK cells contribute to the overzealous production of inflammatory cytokines associated with mortality of septic shock (86,184). Most interestingly, in the latter study, the beneficial effect of the deletion of NK cells by either anti-asialo GM1 or anti-NK1.1 antibodies was only seen when mice were treated with antibiotics. Furthermore, in this CLP model, when bacterial clearance was investigated, discordant results were obtained depending on the nature of the antibodies used for the NK cell depletion (42). Deleterious effects of NK cell activation were reported after infection with both gram-negative (for example, E. coli  and Ehrlichia chaffensis ) and gram-positive bacteria (for example, Streptococcus pneumoniae  and Streptococcus pyogenes ) independent of the site of infection (systemic, peritoneal or pulmonary). Most interestingly, NK cells may also contribute to adverse evolution of the infectious diseases as shown by their association with a Helicobacter pylori-dependent state of early-stage highgrade gastric mucosa-associated lymphoid tissue lymphoma (189) and Mycobacteria-mediated colitis in susceptible hosts (190). Of course and as expected, NK cells contribute to the deleterious effects seen after LPS injections (85,191). Deleterious contribution of NK cells was also demonstrated in the case of murine polytrauma (192) and in the model of cytokine-induced fatal shock (193). In contrast, numerous reports have clearly defined beneficial roles of NK cells in various models of bacterial infectious diseases (see Table 3). For example, the protective role of NK cells was demonstrated in infections induced by M. avium, M. lepraemurium or M. tuberculosis (20, 21, 22, 23,194,195). The protective role of NK cells was also demonstrated in models of infection with different strains of Salmonella (196, 197, 198). Similarly, NK cells were shown to play a critical protective role against S. aureus in septic arthritis and pulmonary models of infection (199,200). In the later case, an elegant study revealed that H1N1 influenza virus infection leads to weakened NK cell activity, particularly in terms of TNF-α production, rendering the host more susceptible to a secondary lung infection by S. aureus (201). The defect of NK cells particularly affected the phagocytic function of alveolar macrophages. In humans, sepsis is associated with a severe lymphopenia that also affects circulating NK cells (202). The decreased number of circulating NK cells persists over 1 wk (203). The most severe depletion of NK cells was found among the patients with the highest mortality (204). During sepsis, the “compensatory antiinflammatory response syndrome” is illustrated by a reprogramming of immune cells (205). Immune status of NK cells is also affected during sepsis. NK cell cytotoxic activity in adult and newborn sepsis patients was decreased (206, 207, 208). A similar observation was reported in trauma (209) and burn patients (210). It was suggested that circulating endotoxin is involved in the suppression of NK cell activity observed in burns (210). In the thermally injured patients with the most severe depressed levels of NK cell activity, IL-2 and IFN-α failed to amplify this response (211). Similar observations were reproduced in animal models after surgery or injection of LPS or other TLR agonists (212, 213, 214). Whereas these observations were reported for spleen and liver NK cells, the peak of the CLP-induced acute lung injury was associated with severe dysfunction of lung NK cells (215). In this study, the authors showed a decrease in cell cytotoxicity, a decrease of the percentage of perforin-positive NK cells and a decrease of IFN-γ-positive cells. We recently showed that IFN-γ and GM-CSF ex vivo productions were altered in splenic NK cells after polymicrobial sepsis murine model (CLP) (Souza-Fonseca-Guimaraes F, Parlato M, Fitting C, Cavaillon J-M, Adib-Conquy M. NK cell tolerance to Toll-like receptor agonists mediated by regulatory T cells after polymicrobial sepsis [submitted]). Enhanced apoptosis of spleen NK cells was reported after CLP and was reversed by injection of IL-15 (216). NK cells initially described for their role in immunosurveillance against tumor cells are fully part of the innate immune response against infection, whatever the type of pathogen (145). Unanswered questions remain: How do PAMPs activate NK cells? If the full signaling cascade downstream of TLRs is present, why do purified NK cells respond poorly to the PAMPs, and how do the accessory cytokines allow them to be activated? If some TLRs are not expressed on the cell surface, what type of PAMP internalization process allows their activation? A great number of intracellular molecules downregulate the TLR-dependent signaling pathways, providing negative signals to turn off cellular activation (217). Are these molecules also acting within NK cells, explaining their dysfunctions noticed in sepsis (207,215)? NK cells are able to release IDO and NO. Could these molecules be part of their arsenal to fight pathogens? Would it be possible in the future to act on NK cells, either to boost their beneficial role during infection or to limit their deleterious effects during sepsis or other acute inflammatory syndrome? In other words, would it be possible to limit the half-devil role of NK cells to only favor their half-angel side? The authors thank Brian Mozeleski for critical review and English corrections. F Souza-Fonseca-Guimaraes was supported by a Pasteur fellowship (Pasteur University International PhD Program).